Clutches are designed, engineered and manufactured to deliver exceptional performance. They are unique and original in design and engineering. Others have copied the design, but they are not able to duplicate the performance and reliability engineered into the Max-Torque clutch. Its exclusive ground sleeve provides a 10 microfinish for smoother bushing contact, less friction and extended life. The stainless steel spring can't rust, assuring more consistent application of shoe pressure. These plus other Max-Torque pioneered features provide the quality Original Equipment Manufacturers (OEM) specify...and you demand. 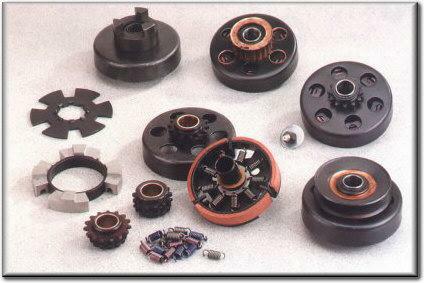 Max-Torque, Ltd. manufactures many special clutches not listed on this web site. If you think a special design is warranted, please contact us for a review and a quote of your application. The automatic centrifugal clutch should be given prime consideration in designing power transmission systems utilizing gasoline engines whose crankshaft does not exceed 3/4" and where the following features are desirable. Minimum Operating Controls - The throttle becomes the single control for engaging or disengaging the power, as well as controlling the operating speed. Speed up the engine and engage the drive train - slow down the engine and it disengages - one control, the throttle does it all. No Load Starting -The standard Max-Torque "SS" automatic clutch is preset to engage at approximately 2,200 rpm. This engagement speed level protects the operator, as well as the power transmission system during engine cranking, starting and idling. Overload Protection and Safety - An automatic centrifugal clutch provides smooth engagement, which protects the engine and drive train against shock and high initial starting stresses. In the event of an overload, the engine will be lugged down to a slower speed, which will automatically disengage the clutch. Once the overload condition has been eliminated, the clutch will reengage and operate normally. This feature maximizes both equipment and operator safety. Clockwise or Counterclockwise - The Max-Torque clutch will operate with equal efficiency in either a clockwise or counterclockwise rotation. The clutch can be mounted inboard or outboard with no adjustments needed. Maintains Appearance - The drum and sprocket have a black oxide finish while the drive and shoe retainer plates are zinc plated. Both finishes help maintain a quality appearance while protecting against rust. Oil Impregnated Bushing - The oil impregnated bronze bushing rotates on a ground sleeve. This configuration, utilizing a high-grade specially formulated oil or grease for bushing lubrication, considerably increases clutch life in high heat conditions over assemblies that use needle bearings. A bushing is more "forgiving" to both heat and contamination than a needle bearing. Sintered Metal Shoes - The Max-Torque clutch uses six sintered metal clutch shoes. The standard clutch is set to engage at 2,200 rpm with the soft action that provides protection to the engine shaft and driven members. The smooth engagement insures safety and eliminates any harsh self-energizing action. The six shoes evenly distribute the centrifugal loading force over 345 degrees of the drum circumference which lessens drum distortion. The smooth non-aggressive engagement action approximates that of an automatic transmission. Stainless Steel Garter Spring - A single, continuous, stainless steel garter spring retains the six floating shoes to maintain uniformity and consistency of engagement and disengagement of the clutch shoes. The stainless steel used is rust resistant and can take higher heat ranges than music wire springs. The SMI (Spring Manufacturers Institute) indicate maximum temperature for music wire springs at 250° F and for #302 stainless steel wire 550 °F. Weldless Construction - All load from the engine is transmitted through splined couplings and keys to minimize distortion and high stress concentrations that can result when brazed or welded connections are used. The clutch can be completely disassembled with snap ring pliers to replace any worn or damaged parts. Works in Contamination - The use of sintered metal shoes and a stainless steel garter spring enables the Max-Torque clutch to maintain its efficiency even when contaminated with dirt, oil, or water.